Some of you might have been wondering where the October news letter was, and I do apologize, however I visited with my wonderful friends up in Alaska and in Texas. This is not a training info letter, but just a short story of our trip. Once again it was an amazing experience and I learned so much. 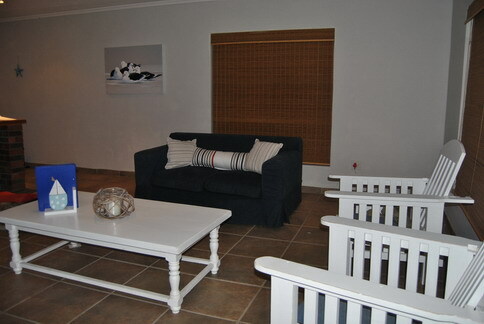 I think one of the fun parts was experiencing that much snow and being able to build a snow man which we named Jake. 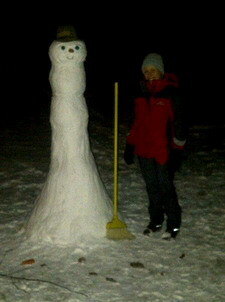 The snow was very powdery so we could not do the traditional rolling of 3 balls, so we made a stick like snow man. But like with training as well, traditional is not always better. Our friends Lynn Orbison and Rich Fox did a road trip with us all the way from Anchorage to Fairbanks to their home in Two Rivers and a week later all the way back to Anchorage. Each time a different scenic route off course, giving me the chance to meet veteran Iditarod winner Jeff King and his dog yard just out side of Denali park which was an incredible experience and also Egil Ellis sprint musher champion in Willow, not only does he have the fastest dogs but he is a pretty nice guy too and his wife Helen Lundberg who is the editor of Dog & Driver magazine. I never realised that my friend Lynn know all these well known mushers, but if I think about it, it makes sense because she's been a sprint musher herself for many years. She went through so much trouble to make our visit memorable. 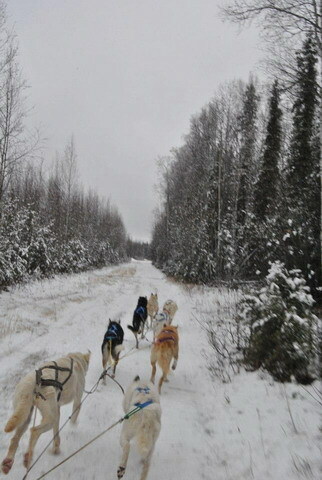 We also went mushing for the first time on snow with Lynn and her dogs. Some of them have retired already, but they still loved the outing and are all great dogs. Keeping a dog yard of that size (30 dogs) happy, clean and fed is a job on its own and I take my hat of to these mushers. Most of the other yards have between 60 – 100 dogs in a yard. My friend Lynn’s dogs are mostly rescued sled dogs that she has taken in, but they are up for adoption if anyone is interested. On our way to Anchorage we also visit the Iditarod head quarters and I found photos of Huskies of a few years ago that look like some of mine. 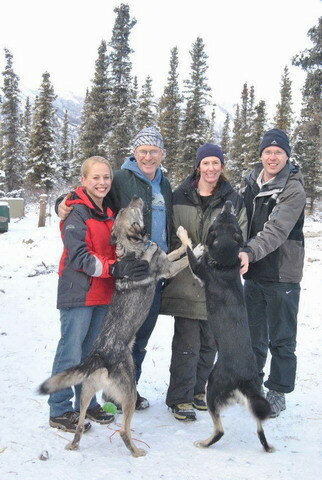 They are from the first Alaskan Huskies before to many pointers have been bred into the breed. From there we left to visit with our other friends Kirsten Frisch and Jon Frisch and off course their wonderful dogs, Kyra who is a 17 year old retired sled dog from Alaska, Larry who is 8 with lots of personality and Joey 4 who is always ready for a ball game. Joey made sure we got our 6km walks in most days and Larry was happy to come along. Kirsten is one of the best dog trainers that I know, and yes I know a few. She gave me the opportunity to work at the centre where she is head trainer called Buddy’s Chance-Buddy is the owner Cara’s dogs name. Here I learned a couple of new training methods from nose work which is a great way to teach your dog to make use of his smelling sense stimulating him mentally, the same way as they would teach search and rescue dogs, this is just simpler so that you can do it at your home with your dog. Cara and Kirsten also certified me while I was there as a reactive dog trainer by attending these classes and working through the theory. I really enjoyed seeing other trainers at work and they really all are very good, from the head trainer to the interns. I even got to train a little fearful dog with her lovely owner. 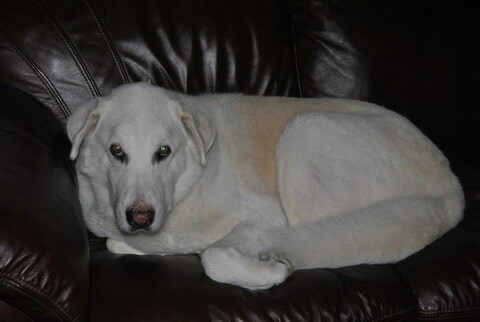 Jasper and I was excited to come home to our own dogs and Logan, but I was very sad leaving my friends behind. Kirsten send me home with a beautiful horse bridal for Marley and a Yukon quest poster signed by all the Yukon quest mushers. Who knew you could have wonderful friends right on the other side of the world. It's a very long flight home but was so worth it.